Thanks to its popularity, baccarat card game can boast with living not only in casinos but also other fields of culture; one of them is cinematography. Modern baccarat develops itself in many films, the most interesting of which had found their audience at once and remained popular even today. The first film about baccarat which comes to mind is, certainly, the film about James Bond - the world-famous Agent 007. But it should not be considered as being the only one movie devoted to this game of luck. We are glad to represent you the short reviews of the most popular baccarat films. 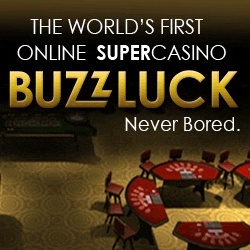 James Bond You'll mistake if you think that the favorite casino game of Agent 007 was poker. Yes, he played it in some films because of the popularity of this game but he always stayed the passionate admirer of baccarat. Mr. 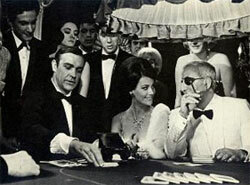 Bond plays baccarat in 5 films, including Dr. No and Golden Eye, but the most popular baccarat film about James Bond is Casino Royale (1967): baccarat is actually the main character of the whole film there. The popular Hollywood actor Jackie Chan is the admirer of baccarat game himself and he often uses a chance to show this fact in his films. The most popular of them is Rush Hour 3 where one of characters tries to seduce a charming lady playing baccarat game. This scene is rather funny because he does not know baccarat rules at all and thinks that he wins by having 3 Kings in his hand. City Hunter is one more film of Jackie Chan where he plays the role of a private detective who appears at a ship full of rich people playing different casino games and spending their lives with luxury. Baccarat is shown as the main casino game there and it stayed being the main one after the ship was captured by terrorists: the main terrorist played baccarat with all hostages one by one and killed everyone who lost this game. This film tells the story of The Beatles when they only started their career as a band: they come to London to take part in a popular TV show where they should perform a concert. John's grandfather plays baccarat in the hotel though does not know this game much; anyway, he was very lucky to win a big money.